This time of year can be difficult time for many people, me included. I hate seeing friends going through so much. I hate seeing others feel things like loss and pain. It is a helpless feeling to watch those you care for struggle with loneliness, especially through what is supposed to be a joyous holiday season. That feeling of helplessness when you are unable to say or do anything make things better for them. This time of year is supposed to be "the most wonderful time of the year." Because of that "stigma;" however, those who are hurting are often afraid to say anything. They suffer in silence too scared to open up and lean on someone. They hold it all inside to "be strong" so not to bring others down. Well, my friends, all of you, those that I am close to and those that maybe I don't know so well, you don't have to be strong. The trick to making the holiday's full of love and happiness is actually sharing. No, not gifts. That is commercialism impersonalizing a very personal time of year. The path to healing and eventually happiness is taken by learning to open up and let go. Share some of your burden with people who care about you, family, friends, even a stranger with an unbiased ear. Trust me- they, we, I, want you to. Love and acceptance is about opening up and showing those broken pieces you feel compelled to hide from the world. Don't. The world needs to see them. "She said "If we're gonna make this work You gotta let me inside even though it hurts Don't hide the broken parts that I need to see" She said "Like it or not it's the way it's gotta be You gotta love yourself if you can ever love me"
The thought of opening up can be frightening, even overwhelming. What if they don't understand? Well trust me, no one will ever understand if you don't give them the chance to try. Talk to someone, anyone. We all need to sometimes. We all need someone. Even though it may feel like it, I promise you are not alone. Google how to talk about depression. There are over 1,000,000 results! Definitely not alone! Here are some tips to help you to open up and talk about what ever it is that has you feeling down, blue, isolated, depressed, or just out of sorts. It may sound simple, but when you are wrapped up in your own head this can feel like an insurmountable task. It doesn't have to be. Find someone you are comfortable talking to, a friend or family member perhaps. And just talk. It doesn't have to be a heavy conversation. Just open up communication. If you go to someone with real statements, honesty and feeling, most of the time they will respond with respect and consideration. Baby Steps. You don't have to spill your whole life story in one sitting. Take it in baby steps, small conversations over a period of time. That way it isn't overwhelming for you nor for whom ever you open up to. 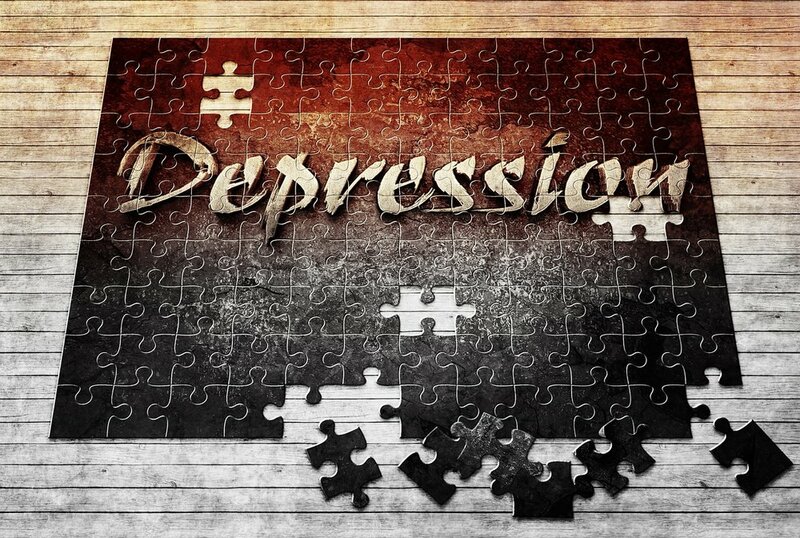 Depression is a like a puzzle, it has many different pieces that fit together to make a whole. Pick one piece and study it it. Talk about it. Even joke about it. Once you understand how that one piece fits into the whole, then move on to a second piece, then a third. With baby steps, one by one you can begin to work through the issues that are keeping you down. Time Heals. It may sound cliche', but it is true. Time heals all things. Heals. Not removes. There are some things that will always hurt. But in time they will hurt less. They will become poignant memories instead of painful realities. Be good to yourself. Allow yourself time to heal. Remember it is OK to feel sad, to miss someone, to feel out of sorts or out of place. Everyone does from time to time. Give yourself the time to heal without being overly harsh on yourself. You don't have to smile. Just because everyone around you seems to be full of joy doesn't mean you have to be as well. It is OK to frown, to scowl, even to cry. The only way to eventually get rid of those negative feelings is to actually feel them. You can't work through what is upsetting you if you push it down and bury it. Don't ignore what you feel. You don't have to let it control you, but don't ignore it either. Use music or art as an outlet. When you are in a bad mood or feeling sad, find music to help you through it. Perhaps something loud and aggressive so you can rage along with the song. Or maybe something melancholy or nostalgic so you can have a good cry. Not in the mood for music? Maybe work on an art project. Try your hand at painting or drawing. Zentangle art is great for those with a more mathematical or scientific mind. If traditional forms are art aren't your thing, perhaps other creative outlets like tying “flies” for fly fishing, widdling, wood or leather working, even gardening is an art form. Anything that utilizes other parts of your brain. Art activates other neural pathways. It allows you to look at life from a different perspective. Not to mention grief, sadness, depression can be a powerful muse. Use it. Let it help you work through what ever is bothering you. The final product will not only be a less troubled you, but also a you who can be proud of your new creativity. Have a good cry! One of my favorite sayings is "The cure for anything is salt water - tears, sweat, or the sea." Tears are cleansing. Tears are cathartic. And tears are not just for women and children! Salt water releases negative "feel good" ions. It is a scientific fact. To put it simply, positive ions are molecules that have lost one or more electrons, whereas negative ions are actually oxygen atoms with extra-negatively-charged electrons. Negative ions are abundant in nature, especially around waterfalls, on the ocean surf, at the beach and after a storm. So have a good cry, go for a walk on the beach, go for a power walk, bicycle ride, or work out in the gym. The sea, sweat, and tears will help clear you head, allowing you the clarity to work through what ever is bothering you. This clarity can help you find the words to open up to that trusted friend or family member. Everyone, and I do mean EVERYONE struggles with depression eventually. You may feel like the only person in the world who is dealing with what ever it is you are going through at this moment. But I promise you are not! Stop trying to be strong for everyone else, and instead be good to you. Holding all that negativity inside is not healthy. Open up and let it out. DISCLAIMER: I am not a counselor or psychologist. I do not claim to have or give medial advice. I am merely sharing what has worked for me in the past when dealing with my own life experiences. If you ever feel like hurting yourself or others, or are feeling suicidal please call a suicide hotline: * 1-800-273-8255 immediately. If you have hurt yourself in some way, call 911!